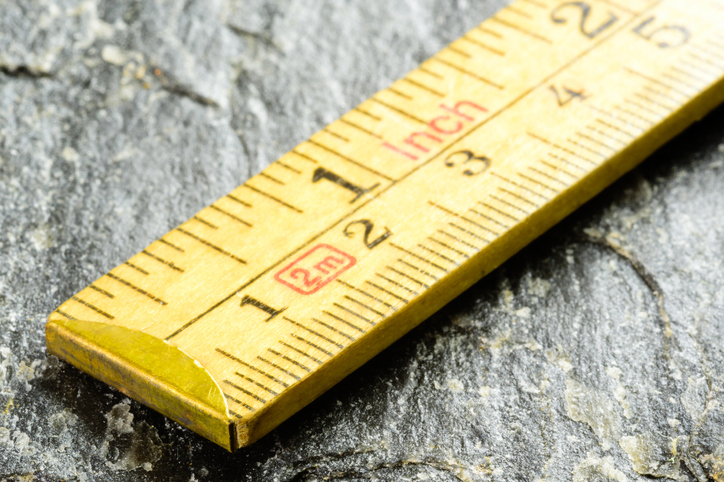 An inch is a unit of length equal to 2.54 centimeters. The top section of my thumb is about a inch long. The rectangle measures four inches by six inches. The car inched slowly through the heavy traffic. The little boy watched the caterpillar inch across the path. within an inch: close to. Example: When the wind became stronger, the mountain climber came within an inch of her life. every inch: completely. Example: That little girl is every inch a lady. In the US, we measure length in inches, feet, yards and miles. An inch is the smallest unit of length. A foot is equal to 12 inches. A yard is equal to three feet. A mile is equal to 5280 feet. There are many tools on the internet to convert these measurements to metric. Here is one that converts inches to centimeters. An inchworm is a type of caterpillar. Perhaps it’s called an inchworm because it inches along. Watch Danny Kaye sing the song “Inchworm” from the movie Hans Christian Andersen. There are other meanings of inch.